The Slide is one of the few devices designed as a smart retrofit system for curtains and blinds. With it, users can use a companion smartphone app to control single or multiple curtains, adjust how far they should open and even set timers and schedules. IFTTT integration takes the Slide’s functionality up a notch, letting users take advantage of other aspiring smart home mainstays like the Flic and Amazon’s Echo. 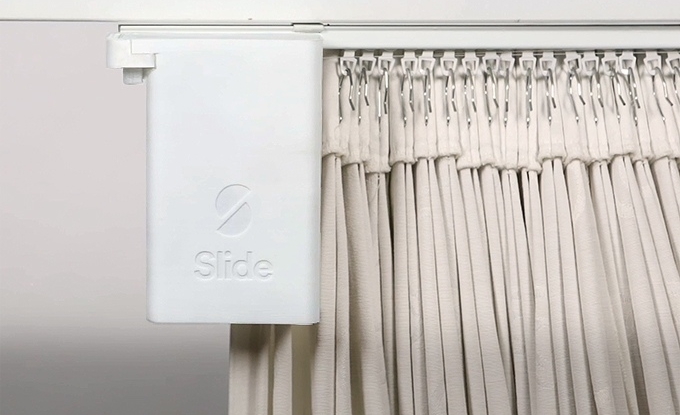 With a wide variety of mounting options and a $78 price point, the Slide is a simply designed and presented curtain solution for those that want a bit more connectivity in their homes. The Slide is slated to ship in August 2017 should its Kickstarter campaign raise about $42,000 by January 8th. Compared to the EZ Wand and Tilt My Blinds, the Slide boasts great presentation and ease of use. The EZ Wand is technically better in that it can work with far more types of curtains but only offers a physical controller instead of Bluetooth/Wi-Fi connectivity. Tilt My Blinds is also interesting in that it offers wireless control and sports a built-in solar panel for even more ease of use — just without the cloud control that the Slide brings to the table.